Today, many investors lack equal access to high-quality investment options. Even when attractive opportunities are accessible, investors still face the daunting task of making sound financial decisions and adhering to a disciplined execution plan. Traditional wealth management solutions are also outdated. Banks, other large financial institutions, and conventional wealth management advisory services rarely innovate, despite changes in consumer preferences, needs, and attitudes. The failure of traditional wealth management services to meet the needs of average investors, combined with limits posed by robo advisors, and the emergence of disruptive platform technologies like Ethereum, offers a promising opportunity for cutting-edge wealth management advisory services on the blockchain. 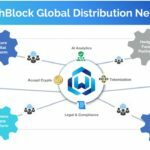 WealthBlock.AI will be the platform to seize this opportunity. WealthBlock.AI is the first decentralized personal finance platform that integrates blockchain, digital assets and artificial intelligence to provide solutions to finance-related problems faced by all investors. At WealthBlock, we have a passion for fighting for the underdogs and making this world a better place by giving everyday people a fair chance to take control of their financial future. We believe that the expanding “internet of value” helps improve our lives, and we are contributing by using the knowledge we have – investment management, blockchain, artificial intelligence, and behavioral science – to help people achieve their financial goals. 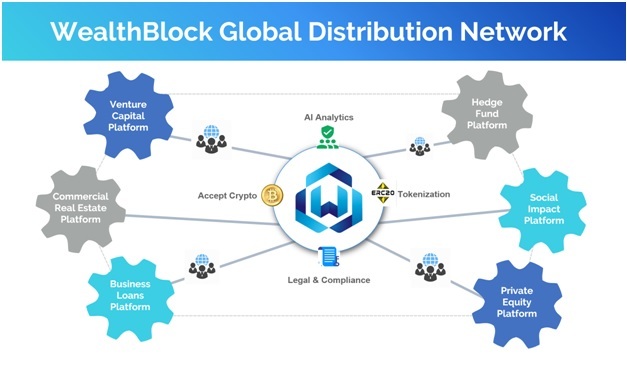 WealthBlock.AI leverages innovations in crowdfunding and blockchain technology to create an environment where all investors, regardless of capital, credentials, and location, have equal and transparent access to alternative investment opportunities. Taking advantage of the tremendous progress in the world of machine learning over the last decade,WealthBlock.AI helps investors make better decisions and automatically executes their financial plans. WealthBlock is issuing Trilliam Tokens (TRIM) to facilitate the operation and development of the WealthBlock.AI community. 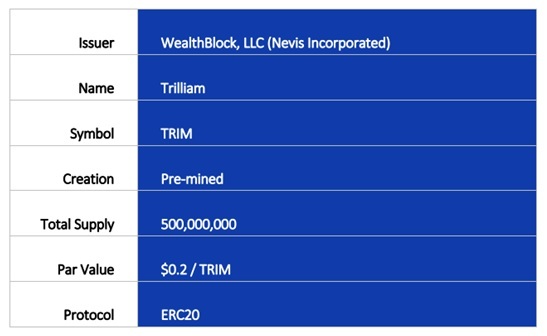 The Trilliam Token (TRIM) is a payment utility token used on the WealthBlock platform. TRIM tokens can be used to pay fees to WealthBlock for any services offered through the platform (e.g. management fees, service fees, transaction fees, tech fees and more) at a fixed price of $0.2/TRIM. Through frequent use of the platform, token holders will be the direct beneficiaries of the cost-effective services that WealthBlock will provide, including efficiencies across payments, asset transfer and custody, and dividend reinvestment. 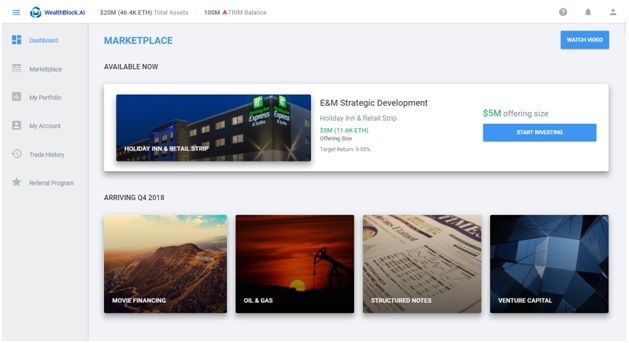 TRIM also provides the WealthBlock organization the tools needed to incentivize and grow its ecosystem, thus making token holders and platform users direct beneficiaries. Today, the TRIM token can be used to pay for all WealthBlock.AI technology fees incurred during investment activities on the platform. The platform is currently live at https://wealthblock.ai/blockchainsale. Compared to traditional startup funding models where VCs and large institutions govern the development direction and are the primary beneficiary, we believe crowdfunding allows us to reach the user and investor base with whom our interests and values are truly aligned. We built WealthBlock to democratize access to alternative assets and provide a turn-key personal financial solution for everyday people. Crowdfunding, blockchain and tokenization are the means we use to reach our target user base directly. So naturally, we are using this model for our own token sale. We want our user base to become the primary beneficiary of our success and the owner of the platform. The purchase of TRIM tokens can be made on our website: https://wealthblock.ai/blockchainsale by using our WealthBlock platform directly. Individuals whom are eligible can open a WealthBlock account and earn TRIM tokens as a New Account bonus, provided participants are from a participating country and pass KYC/AML. Non-participating countries where ICOs are blacklisted include Abu Dhabi, Bangladesh, Bolivia, Canada, China, Ecuador, Kyrgyzstan, Morocco, Singapore, South Korea.